The National Aeronautics and Space Administration (NASA), formed in 1958, is the United States government agency responsible for the civilian space program as well as aeronautics and aerospace research. NASA oversaw the Apollo moon-landing missions, the Skylab space station, and later the Space Shuttle. NASA conducts more tests of its ‘impossible engine’, and the first public update in months suggests fuel-free thrusters do work — but they don’t know why. Paul March, one of the top engineers working the EM Drive thruster at the Eagleworks Laboratory at the Johnson Space Center in Texas, posts the update on the NASA Spaceflight forum in response to a claim the unaccounted thrust is generated by something known as the Lorentz force, a force that is exerted by a magnetic field on a moving electric charge. March says his tests prove this is not true. I will tell you that we first built and installed a second generation, closed face magnetic damper that reduced the stray magnetic fields in the vacuum chamber by at least an order of magnitude and any Lorentz force interactions it could produce, and yet the anomalous thrust signals remain. March says they have managed to remove some of the errors from earlier tests – but still found signals of unexplained thrust. 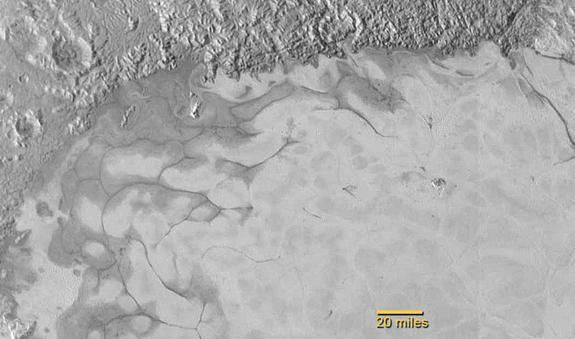 NASA says that Pluto has traces of water and ice on its surface. Red-colored frozen surface water is confirmed by combining spectral infrared and visible light data taken by two of New Horizons’ image sensors. 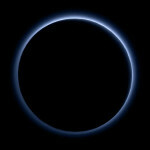 The agency also releases a picture of Pluto’s blue sky, which is caused by tiny, sunlight-scattering particles in the atmosphere. 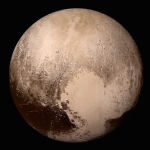 Those particles probably begin as molecular nitrogen (which Pluto is constantly emitting) and other trace gases. 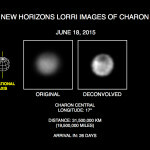 NASA releases detailed photos and a flyover animation of Charon, taken by New Horizons when it made its close flyby of Pluto on July 14. Scientists say they expected to find a long-dead world pocked with craters, but instead the surface plays host to mountains, a red north pole and a host of other geological features including a canyon more than 1,000 miles wide that stretches across the moon’s Pluto-facing side, and perhaps along the far-side of the world. That canyon is probably four times longer than the Grand Canyon is on Earth, and twice as deep in some places. We thought the probability of seeing such interesting features on this satellite of a world at the far edge of our solar system was low, but [we] couldn’t be more delighted with what we see. The only thing we can really assert is that the places we’re finding are probably more habitable than the rest of the planet, which is bone dry. It looks more like tree bark or dragon scales than geology. This’ll really take time to figure out; maybe it’s some combination of internal tectonic forces and ice sublimation driven by Pluto’s faint sunlight. The ripples are part of a 70MB image (link) that combines images from the probe’s Ralph/Multispectral Visual Imaging Camera, that combines blue, red and near infrared (NIR) images. Even as the New Horizon’s spacecraft speeds away from Pluto out into the Kuiper Belt, and the data from the exciting encounter with this new world is being streamed back to Earth, we are looking outward to the next destination for this intrepid explorer. While discussions whether to approve this extended mission will take place in the larger context of the planetary science portfolio, we expect it to be much less expensive than the prime mission while still providing new and exciting science. NASA starts multiple blogs on tumblr. It will share photos, text and videos in its main blog. The second blog is by astronaut Peggy Whitson who chronicles her training. The third microblog posts photos of Jupiter taken by NASA’s Juno mission and other astronomers. The last blog is by Curiosity Rover from Mars. The agency continues to add new platforms like Tumblr to offer the public a comprehensive view of NASA’s missions, facilities and people. Speaking before the House Committee on Science, Space and Technology, Stern says scientific information gleaned from the New Horizons mission to Pluto is “revolutionizing” what they know about the icy dwarf planet, predicting that even greater discoveries lay ahead. With only 5% of data on the ground, we all feel we need to fasten our seat belts for the next 95%. 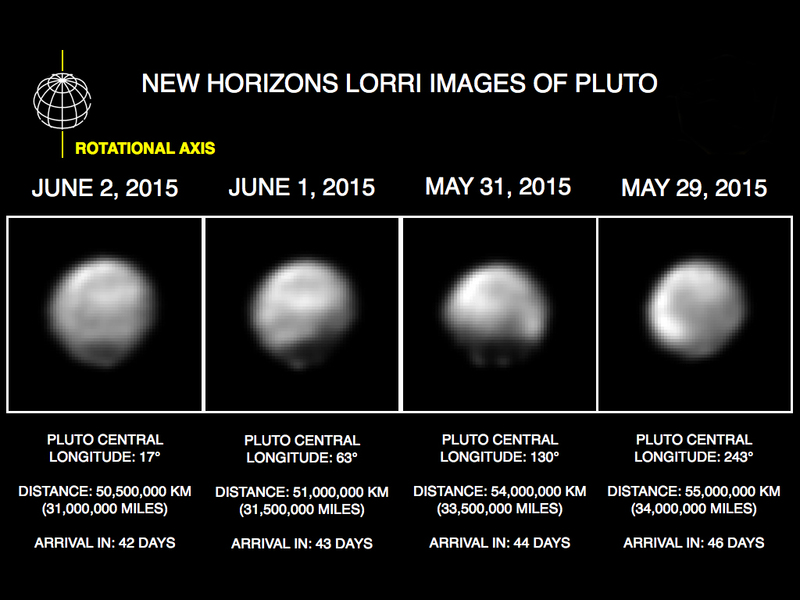 It will take 16 months for all the collected data from New Horizons to be transmitted to Earth. Scientists say the mission demonstrates this need for further planetary exploration. Now is the time to accelerate, not curtail, the pace and scope of our nation’s solar system exploration program. NASA releases this photo which shows Pluto’s reddish color and Charon’s gray tone. Scientists think Pluto’s red color is the result of particles created in its atmosphere, through methane’s interaction with UV light. The particles stick together, growing heavier, and eventually rain down on the surface. Observations show that Charon does not have much of an atmosphere. 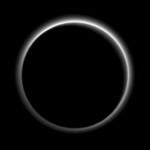 For now, all that we can say is, it’s a much more rarefied atmosphere [than Pluto’s]. It may be that there’s a thin nitrogen layer in the atmosphere, or methane, or some other constituent. But it must be very tenuous compared to Pluto — again, emphasizing just how different these two objects are despite their close association in space. NASA releases a photo of Pluto eclipsing the sun showing a haze in Pluto’s atmosphere which extends at least 160 km (100 miles) above the surface. 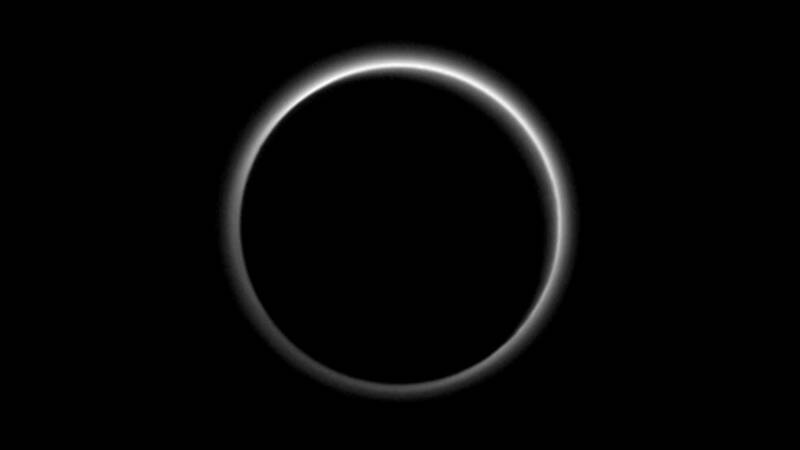 This is one of our first images of Pluto’s atmosphere. [It] stunned the encounter team. For 25 years, we’ve known that Pluto has an atmosphere. But it’s been known by numbers. This is our first picture. This is the first time we’ve really seen it. This was the image that almost brought tears to the eyes of the atmospheric scientists on our team. 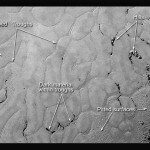 NASA releases a photo which suggests that glaciers are flowing on Pluto’s surface in the region of Sputnik Planum. Scientists believe the ice is made of nitrogen, carbon monoxide and methane. To see evidence of recent geological activity is simply a dream come true. The appearance of this terrain, the utter lack of impact craters on Sputnik Planum, tells us that this is really a young unit. 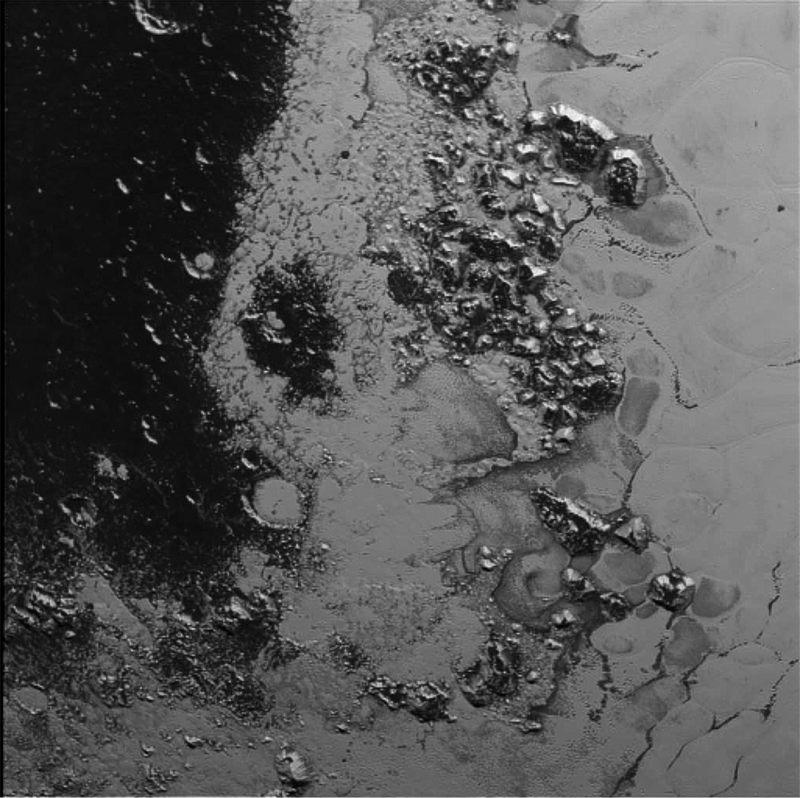 NASA releases a sharper image of Pluto showing that the left half of the Tombaugh Regio heart region is different than the right. The left half is more filled in. Scientists believe some process, possibly wind, is blowing material from the left half to the right half. Our interpretation is that material in the right lobe — the source for that material — is coming from the western [or left] lobe. NASA’s Kepler mission discovers Kepler-452b, the first near-Earth-size planet in the habitable zone around a sun-like star. 425b is located about 1,400 light years away in the Constellation Cygnus, orbiting a star slightly brighter than the sun. The planet is about 60% larger than Earth and about 1.5 billion years. There is no evidence that it has an atmosphere. We can think of Kepler-452b as an older, bigger cousin to Earth, providing an opportunity to understand and reflect upon Earth’s evolving environment. It’s awe-inspiring to consider that this planet has spent six billion years in the habitable zone of its star; longer than Earth. That’s substantial opportunity for life to arise, should all the necessary ingredients and conditions for life exist on this planet. 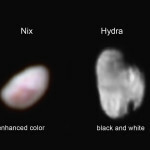 NASA releases photos of Pluto’s moons Nix and Hydra. Nix is about 42 km (26 miles) long and 36 km (22 miles) wide. 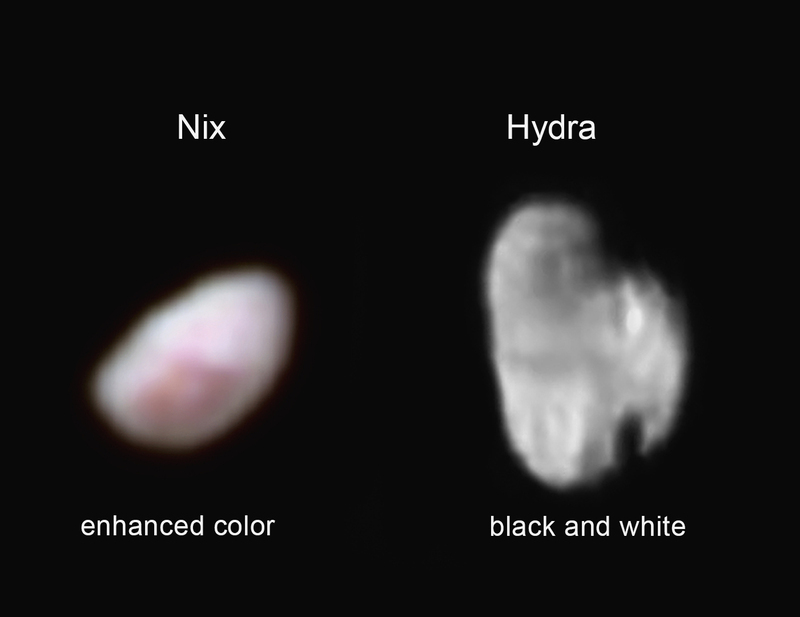 Nix’s surface is a light gray with an area that is light red which scientists think might be a crater. Hydra is about 55 km (34 miles) long and 40 km (25 miles) wide and has at least two large craters. Before last week, Hydra was just a faint point of light, so it’s a surreal experience to see it become an actual place, as we see its shape and spot recognizable features on its surface for the first time. 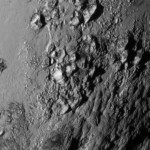 NASA releases a photo showing another mountain range on the lower left edge of Pluto’s heart-shaped region. The peaks are about 1 to 1.5 km (0.5 to 1 mile) high, about the size of the Appalachians. 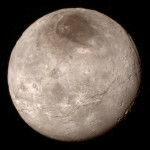 The new range is just west of the region within Pluto’s heart called Sputnik Planum (Sputnik Plain) and some 110 km (68 miles) northwest of Norgay Montes. This newest image further illustrates the remarkably well-defined topography along the western edge of Tombaugh Regio. 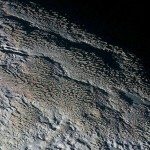 NASA releases a flyover animation over part of Tombaugh Regio, the heart-shaped area of Pluto, and the Norgay Montes mountains, which are named for Tenzing Norgay, the sherpa who accompanied Edmund Hillary on the first successful ascent of Mt. Everest. 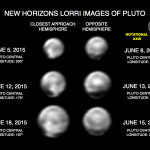 The animation is created from images taken by the Long Range Reconnaissance Imager (LORRI) on the New Horizons probe during the Pluto flyby on July 14, 2015. 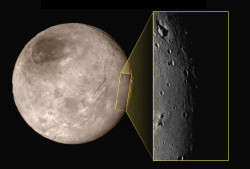 Using photographs taken from just 77,000 kilometers (48,000 miles) away from the surface, the resolution is good enough that features as small as a kilometers across (0.5 miles) are visible. NASA releases a close-up photo of an area in the center-left of the heart feature of a young craterless plain which they name Sputnik Planum. It has a broken surface of irregularly-shaped segments, roughly 20 km (12 miles) across, bordered by what appear to be shallow troughs, some of which have darker material within them, while others are traced by clumps of hills that appear to rise above the surrounding terrain. 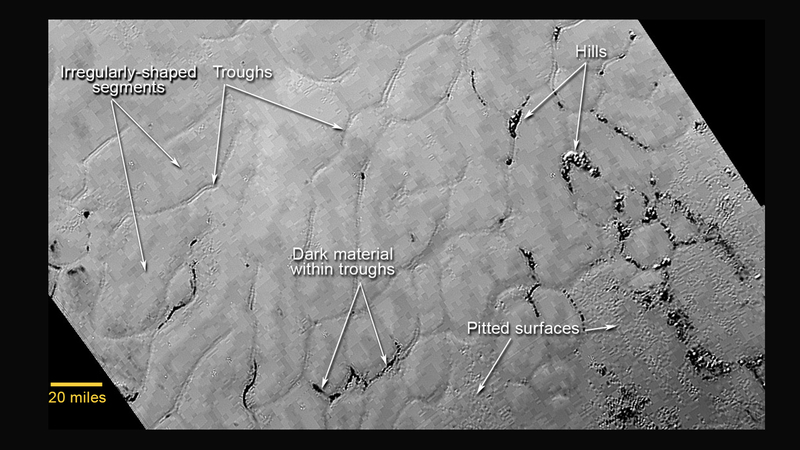 Elsewhere, the surface appears to be etched by fields of small pits that may have formed by sublimation. NASA shares a close-up photo of Pluto’s moon Charon showing a large mountain in a deep depression that is puzzling scientists. The most intriguing feature is a large mountain sitting in a moat. This is a feature that has geologists stunned and stumped. It looks like someone just dropped a giant boulder on Charon. Mission scientists say the image show a terrain that had been resurfaced by some geological process – such as volcanism – within the last 100 million years. We have not found a single impact crater on this image. This means it must be a very young surface. This active geology needs some source of heat. Previously, such activity has only been seen on icy moons, where it can be explained by “tidal heating” caused by gravitational interactions with a large host planet. You do not need tidal heating to power geological activity on icy worlds. That’s a really important discovery we just made this morning. 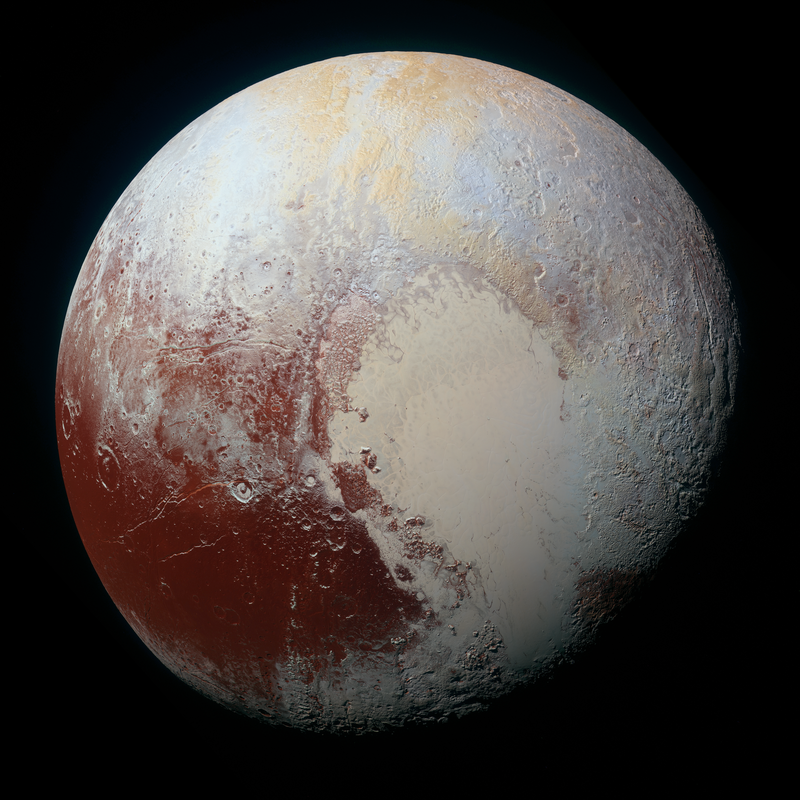 Scientists name Pluto’s newly-discovered heart-shaped region Tombaugh Regio, after Tombaugh, who discovered the planet in 1930. 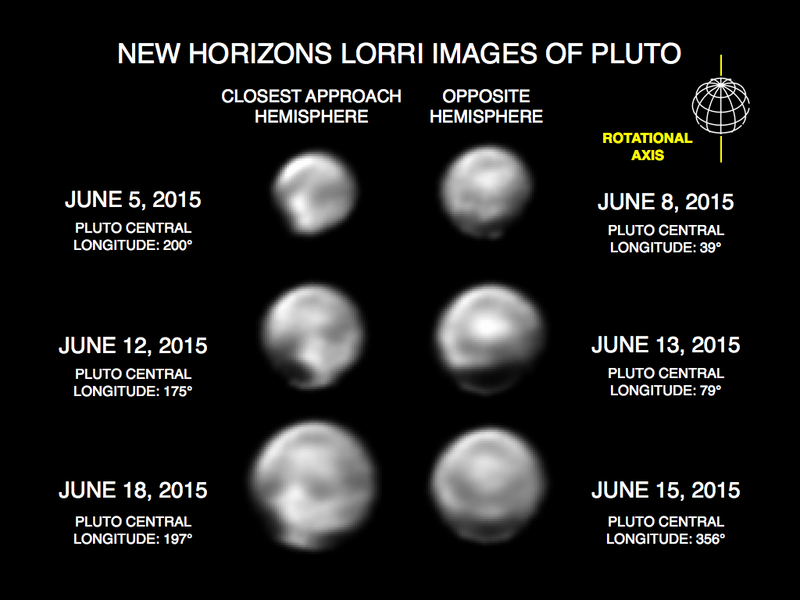 The New Horizons team release a composite photo showing different methane ice accumulations over Pluto’s surface. The photo is compiled using RALPH’s 256 infrared wavelengths overlaying a LORRI basemap. All I’m showing is the diversity of terrains. The ices do have distinct properties, different melting points. After flying three billion miles from Earth, at 7:49 a.m. EDT, New Horizons makes its closest approach to Pluto at 7,700 miles from the surface. It flies past at 31,000 mph. The team receives confirmation from the spacecraft around 9:00 p.m. EDT that the flyby is a success. Hey, people of the world! Are you paying attention? We have reached Pluto. We are exploring the hinterlands of the solar system. Rejoice! 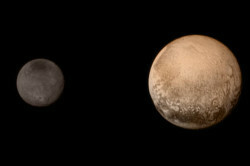 NASA releases color images of Pluto and Charon. 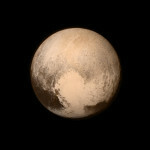 The heart shape on Pluto is different colors indicating different geologic, tectonic, or morphological origins. 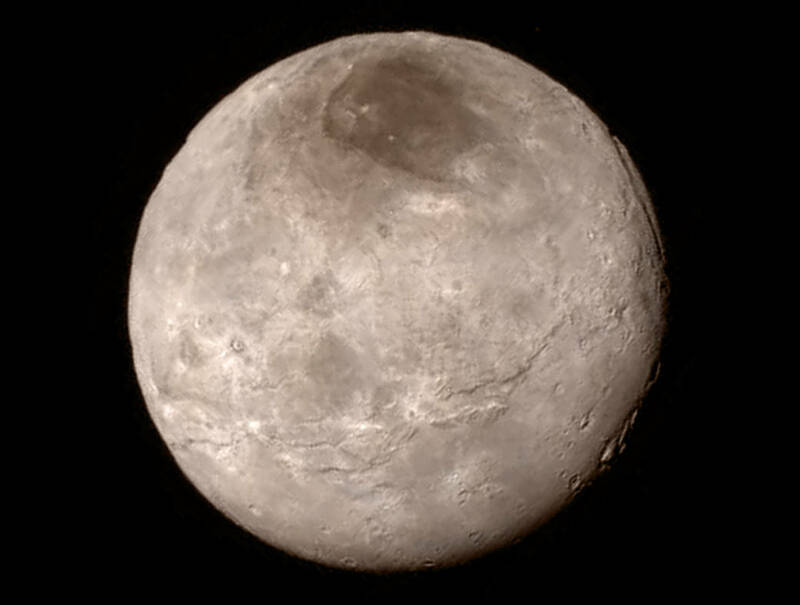 The big red spot near Charon’s north polar region are most likely nitrogen particles from Pluto. The sun burns off the particles on the areas facing the sun, but not the polar region which faces away from the sun for decades. Some regions are relatively ancient, and other places are very young and currently undergoing geologic evolution. New Horizons takes a photo of Pluto from 768,000 km (476,000 miles) away showing a close-up view of the heart-shaped feature. The heart measures about 1,600 km (1,000 miles) across. The heart borders darker equatorial terrains, and the mottled terrain to its east (right) are complex. However, even at this resolution, much of the heart’s interior appears remarkably featureless—possibly a sign of ongoing geologic processes. Wow! My prediction was that we would find something wonderful, and we did. This is proof that good things really do come in small packages. 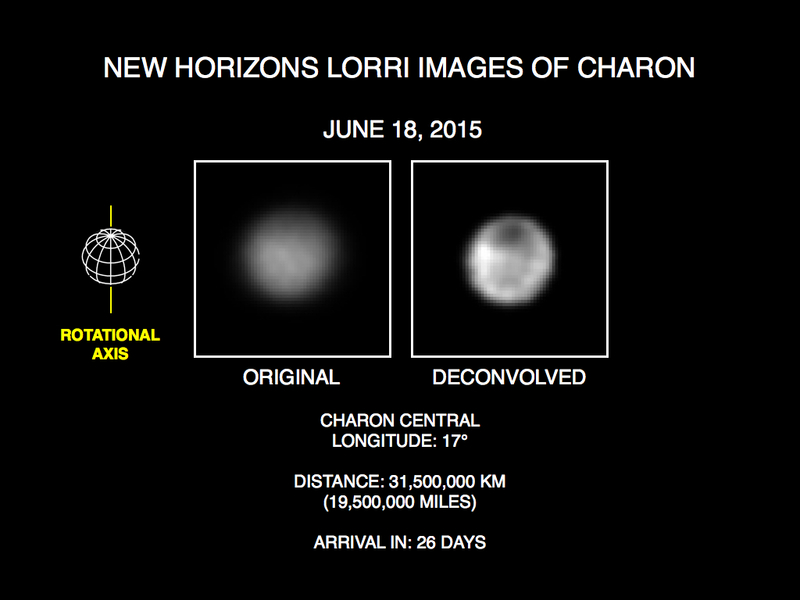 New Horizons takes a photo of Charon from 466,000 km (289,000 miles) away. A series of cliffs and valleys stretch about 1,000 km (600 miles) from left to right, suggesting widespread fracturing of Charon’s crust. At upper right is a canyon about 7-9 km (4-6 miles) deep. The north polar region reveals a dark spot suggesting a thin deposit of material. The lack of craters suggests that the surface is still young being reshaped by geologic activity. NASA’s New Horizon mission scientists determine Pluto’s size to be 2,370 kilometers (1,473 miles) in diameter making it the largest known body beyond Neptune. The size of Pluto has been debated since its discovery in 1930. We are excited to finally lay this question to rest. They also determine Charon’s size to be 1208 km (751 miles) in diameter, Hydra is about at 45 km (30 miles) and Nix is about 35 km (20 miles). 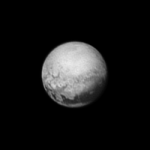 At 4 million km (2.5 million miles), New Horizons takes this photo of Pluto’s far side showing four dark mysterious spots about 480 km (300 miles) across. 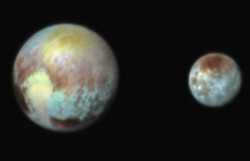 The spots are connected to a dark belt that circles Pluto’s equatorial region. What continues to pique the interest of scientists is their similar size and even spacing. It’s weird that they’re spaced so regularly. We can’t tell whether they’re plateaus or plains, or whether they’re brightness variations on a completely smooth surface. This will be the best picture of Pluto’s far side, which always faces Charon, as the probe will be on the other side as it passes by Pluto. The team puts together a photo from New Horizons LORRI and RALPH showing a portrait of Pluto and Charon as the probe makes its final approach. New Horizons takes this photo 5.4 million km (3.3 million miles) from Pluto which starts to show distinct geological features on the surface. 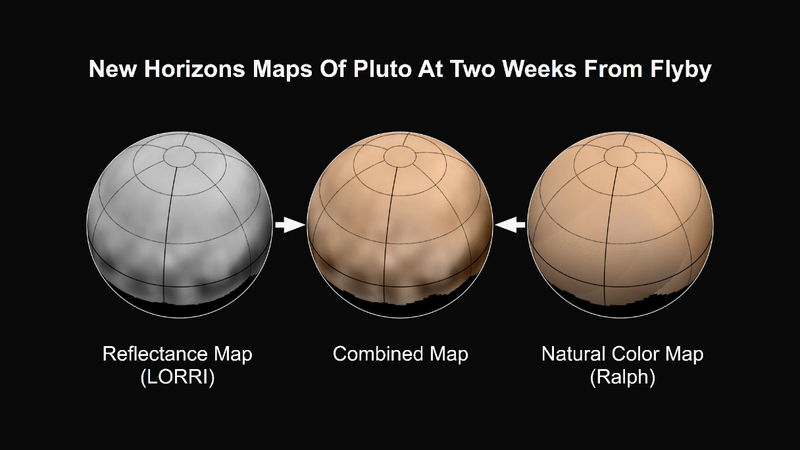 We’re close enough now that we’re just starting to see Pluto’s geology. Among the structures tentatively identified in this new image are what appear to be polygonal features; a complex band of terrain stretching east-northeast across the planet, approximately 1,000 miles long; and a complex region where bright terrains meet the dark terrains of the whale. NASA releases this map compiled from photos taken between June 27 and July 3 showing the following features along the equator: The long dark area on the left, named “the whale” measures 3,000 km (1,800 miles), above the whale’s tail is a doughnut shaped area measuring 350km (200 miles) across, to the right of the whale’s head is the brightest region, and further to the right are four mysterious dark spots. New Horizons resumes normal operations on its main computer. The team determines that the problem was that the main computer was overloaded due to a timing conflict in the spacecraft command sequence. The computer was tasked with receiving a large command load at the same time it was engaged in compressing previous science data. The main computer responded precisely as it was programmed to do, by entering safe mode and switching to the backup computer. Thirty observations were lost during the recovery period, but they did not affect any critical observations. I’m pleased that our mission team quickly identified the problem and assured the health of the spacecraft. Now – with Pluto in our sights – we’re on the verge of returning to normal operations and going for the gold. At 1:54 pm New Horizons’ autonomous autopilot recognizes a problem, stops communicating with mission control on Earth, switches from the main to the backup computer and puts the probe into safe mode. It then begins to send information to engineers to help diagnose the problem. At 3:15 pm communication is restored. At 4:00 pm the team meets to resolve the problem and restore the probe to its flight plan. The probe is not able to collect science data at this time. 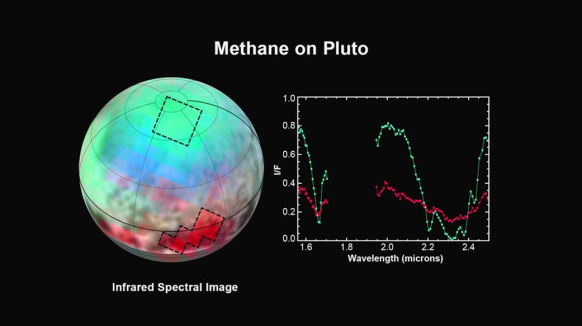 New Horizons’ RALPH instrument confirms that Pluto is reddish brown probably caused by hydrocarbon molecules that are formed when cosmic rays and solar ultraviolet light interact with methane in its atmosphere and on its surface. 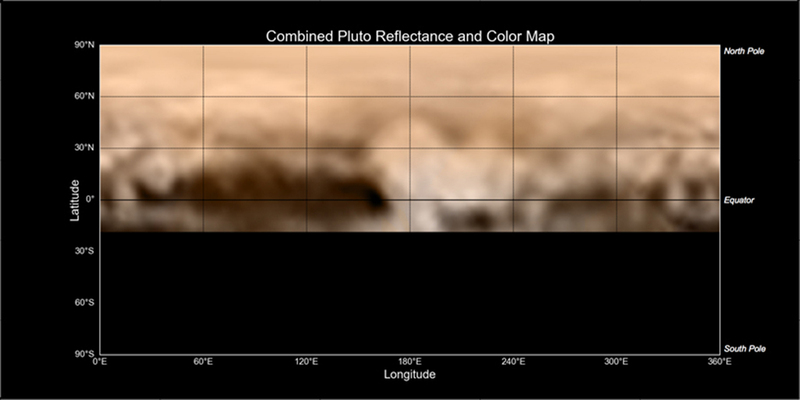 Pluto’s reddish color has been known for decades, but New Horizons is now allowing us to correlate the color of different places on the surface with their geology and soon, with their compositions. This will make it possible to build sophisticated computer models to understand how Pluto has evolved to its current appearance. 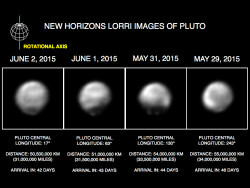 NASA releases photos that show Pluto’s two different faces. The right photo shows a series of four evenly spaced dark spots along the equator. The left photo shows the hemisphere the probe will view as it flies by. It’s a real puzzle—we don’t know what the spots are, and we can’t wait to find out. After a detailed search for dust clouds, rings, and other potential hazards, the New Horizons team decides the spacecraft will remain on its original path through the Pluto system instead of making a late course correction to detour around any hazards. Because the probe is traveling at 49,600 km/h (30,800 mph), a particle as small as a grain of rice could be lethal. New Horizons fires its thrusters for 23 seconds speeding up about a half mile per hour in order to perfect its course through the Pluto system. Without the adjustment, the probe would have arrived 20 seconds late and 114 miles (184 kilometers) off-target from the spot where it will measure the properties of Pluto’s atmosphere. Those measurements depend on radio signals being sent from Earth to New Horizons at precise times as the spacecraft flies through the shadows of Pluto and Pluto’s largest moon, Charon. The probe is 16 million km (10 million miles) from the Pluto system and about 4.75 billion km (2.95 billion miles) from Earth. This maneuver was perfectly performed by the spacecraft and its operations team. Now we’re set to fly right down the middle of the optimal approach corridor. SpaceX has demonstrated extraordinary capabilities in its first six cargo resupply missions to the station, and we know they can replicate that success. We will work with and support SpaceX to assess what happened, understand the specifics of the failure and correct it to move forward. This is a reminder that spaceflight is an incredible challenge, but we learn from each success and each setback. 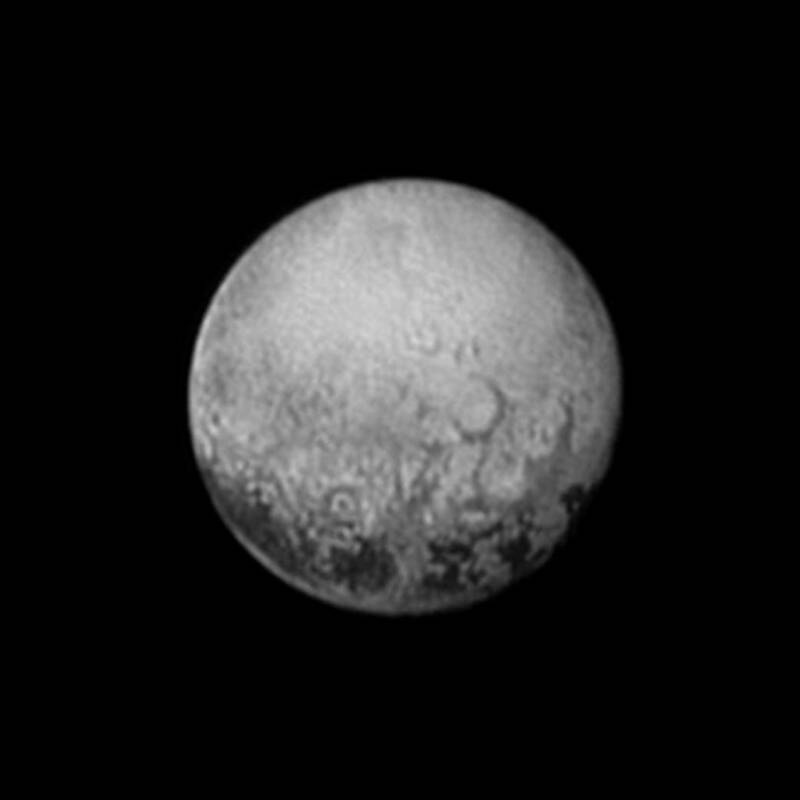 NASA releases a series of photos of Pluto as the New Horizons probe approaches. The close approach hemisphere that the probe will pass by shows the greatest variation in surface features. The probe is 4.7 billion km (2.9 billion miles) from Earth and just 25 million km (16 million miles) from Pluto. This system is just amazing. The science team is just ecstatic with what we see on Pluto’s close approach hemisphere: Every terrain type we see on the planet—including both the brightest and darkest surface areas —are represented there, it’s a wonderland! NASA releases a photo of Charon showing a dark region near its north pole. The unambiguous detection of bright and dark terrain units on both Pluto and Charon indicates a wide range of diverse landscapes across the pair. . . . And about Charon—wow—I don’t think anyone expected Charon to reveal a mystery like dark terrains at its pole. Who ordered that? NASA releases a series of photos as the New Horizons probe approaches showing areas of intermediate brightness and also very bright and very dark surface features. The probe is 4.7 billion km (2.9 billion miles) from Earth and 39 million km (24 million miles) from Pluto. Even though the latest images were made from more than 30 million miles away, they show an increasingly complex surface with clear evidence of discrete equatorial bright and dark regions—some that may also have variations in brightness. 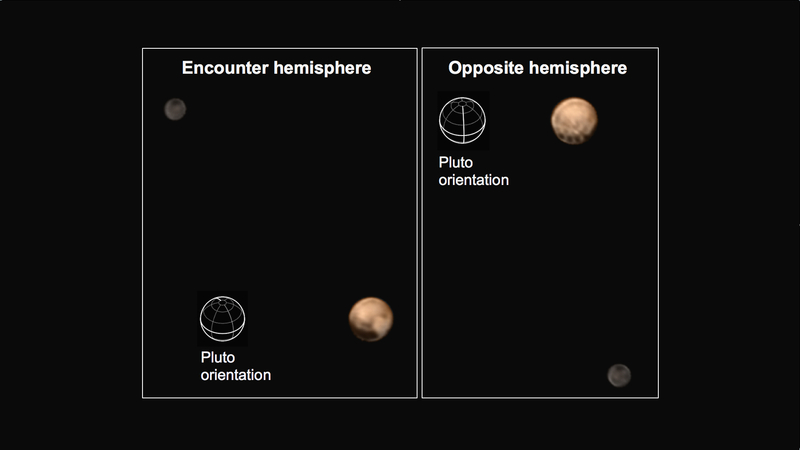 We can also see that every face of Pluto is different and that Pluto’s northern hemisphere displays substantial dark terrains, though both Pluto’s darkest and its brightest known terrain units are just south of, or on, its equator. Why this is so is an emerging puzzle. NASA reports that the last intact section of the Larsen B Ice Shelf, which has existed for at least 10,000 years, is weakening fast and will likely disintegrate completely in the next few years, contributing further to rising sea levels. What is left covers about 1,600 square km. A NASA glaciologist says analysis of the data reveals that a widening rift in Larsen B will eventually break it apart completely, probably around the year 2020. Once that happens, glaciers held in place by the ice shelf will slip into the ocean at a faster rate and contribute to rising sea levels. This study of the Antarctic Peninsula glaciers provides insights about how ice shelves farther south, which hold much more land ice, will react to a warming climate. NASA plans to launch an unmanned spacecraft that will retrieve a boulder from a nearby asteroid and move it into orbit around the Earth’s moon. Astronauts will then work to collect samples from the boulder. Astronauts will conduct spacewalks outside Orion to study and collect samples of the asteroid boulder wearing new spacesuits designed for deep space missions. Collecting these samples will help astronauts and mission managers determine how best to secure and safely return samples from future Mars missions. NASA finds evidence that a massive ocean once covered one-fifth of Mars’s surface (nearly half of its northern hemisphere). The size of this body of water is comparable to Earth’s Atlantic Ocean; however the Mars ocean contained more water (20 million cubic kilometers) than the Atlantic contains now. Ultimately we can conclude this idea of an ocean covering 20% of the planet which opens the idea of habitability and the evolution of life on the planet…e now know Mars was wet for a much longer time than we thought before…Ten years ago, the story of water on Mars was an occasional flood of rocky debris every 100m years that then switched off again. We now know it’s more continuous. There were long-standing bodies of water: lakes, deltas and perhaps even seas. How audacious! How exciting! The solar system is mankind’s — this mission is the first step to take it. It’s ours… It’s these steps that will lead us beyond this planet and on to Mars and out into the solar system. I truly believe that a single-planet species will not survive long. It’s our destiny to move off this planet. While not a NASA mission, the pain of this tragedy will be felt by all the men and women who have devoted their lives to exploration. Space flight is incredibly difficult, and we commend the passion of all in the space community who take on risk to push the boundaries of human achievement.